For the second day of Tortillas Dishes, I decided to make a Fajitas. Only after taking this up, I realized I was confused between a Fajita, taco and for that matter the quesdillas as well. So that meant I do some research on the different types of Tortilla dishes, especially how different a Fajita is from a Taco or a Quessadilla. For a Fajitas, frilled meat is served with tortillas and assorted condiments on the side. 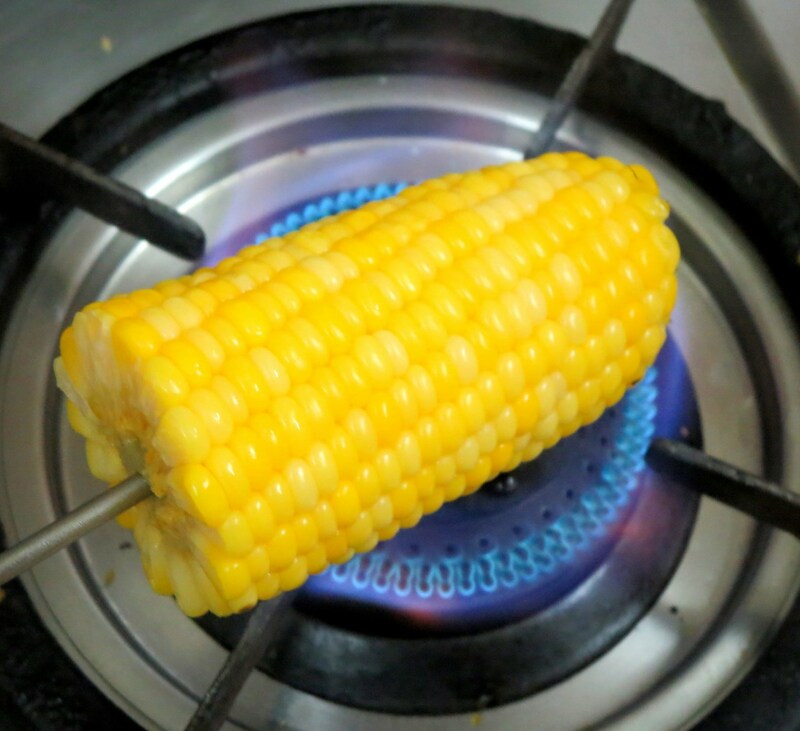 This can be eaten as a taco or burrito style. A Quesadillas is a large tortilla, folded in half, stuffed with Queso (cheese) and other optional stuffing, then grilled on the outside. Tacos are traditionally small palm sized tortilla, warmed and served open faced or lightly folded. The stuffing can be spiced meat/vegetable garnish. These can be optionally served with cheese. 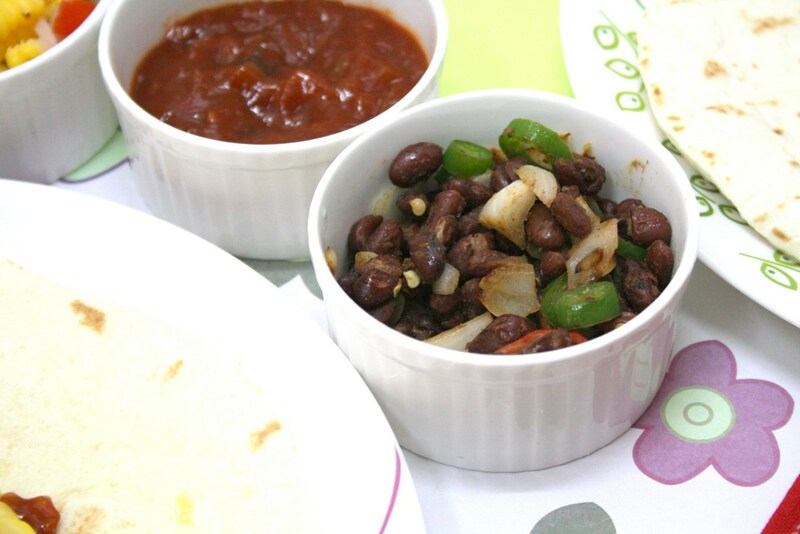 Burritos on the other hand is similar to a taco in ingredients but uses a larger tortilla served as a closed, cylindrical “wrap”. Salsa on a bed of tomato salsa sauce. 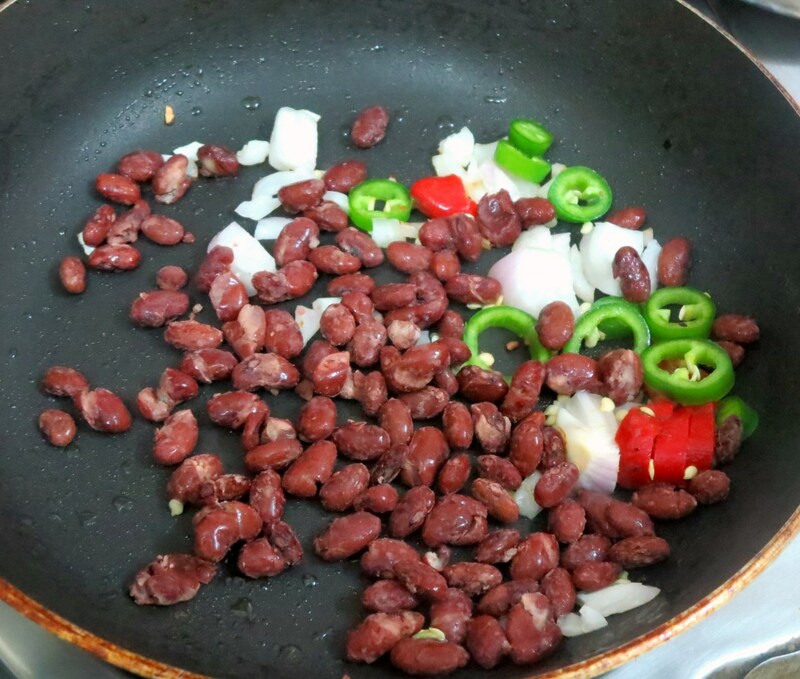 Soak the bean overnight and change waters couple of times before pressure cooking. Add enough water and pressure cook till tender. 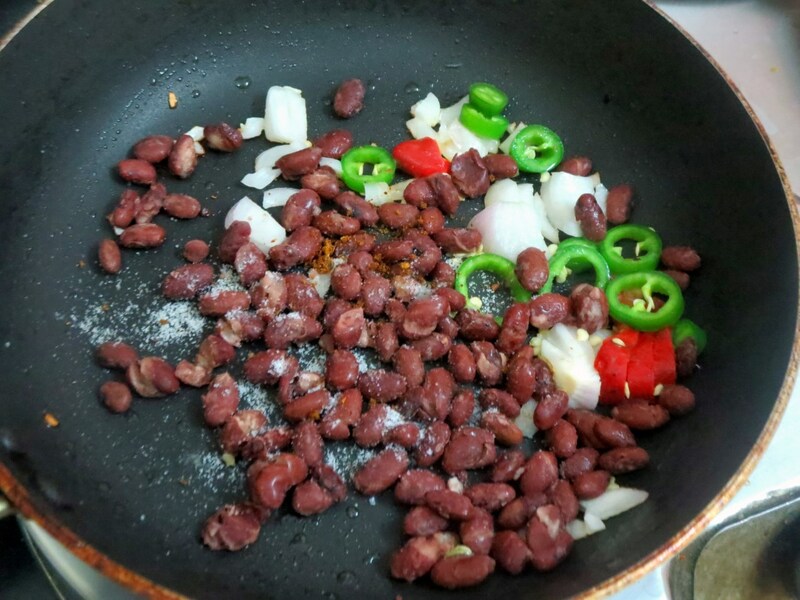 Heat a pan with oil, toss the tenderr beans, add finely chopped onions, chopped jalapones. Add salt and fajita seasonings. Toss everything and combine well. Warm the tortillas over hot pan. 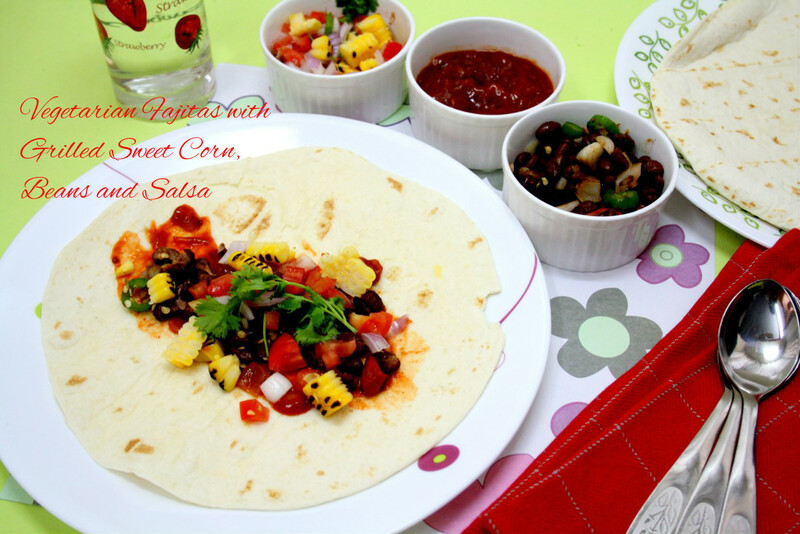 Transfer to a serving plate, spread the tomato salsa in the middle, spread a base of beans over it followed by Roasted Corn onion and tomato salsa. Fold on both sides and serve. Very interesting post! and this is one of our favourite cuisines, tempted to dig in. 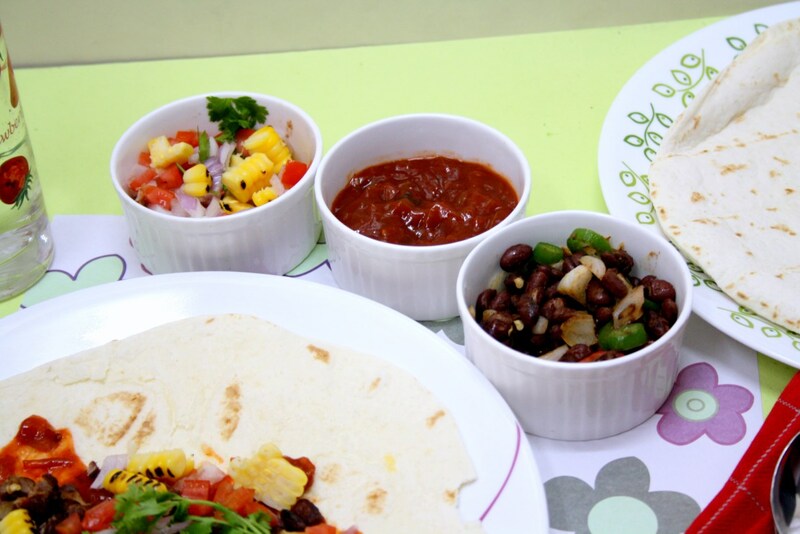 tempting me to try mexican cuisine a lot..so colorful and delicious..
Yummy looking Mexican food Valli. Your fajitas look so colorful and filling. Wow Valli this is yum too. Why are you tempting me thus. 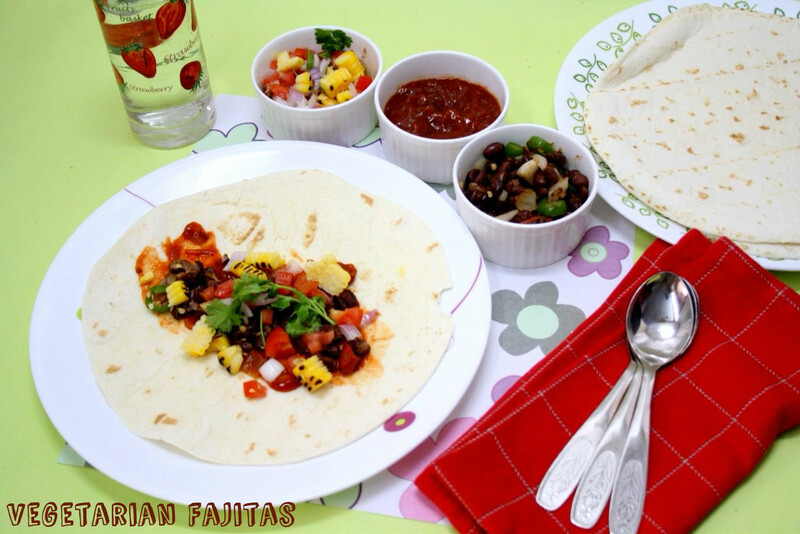 Fresh and tasty looking fajita…yummy! What a refreshing spread Valli! Love your clicks. So bright and vibrant. wow your fajitas looks so delicious .Wish to grab a bite .. It is the sizzling grilled filling that makes a fajita. Yours looks nice and colorful. fajitas is one of my faves when you go to restaurants and they bring the sizzling plate right to the table, this homestyle version looks delish! This is too much, u makes me hungry Valli.. totally drooling here.